This warm, comfortable Womens sweatshirt was created from a very high quality, plush, cotton blend fabric. It is presented in gray, salmon and cream. 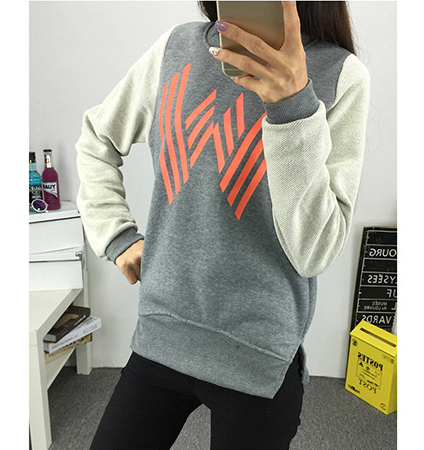 The geometric graphic image on front is salmon, accenting the other two colors beautifully. The shirt has slits on both sides to provide the wearer a greater range of motion. It has a crew neckline and knit ribbing at the cuffs. The sleeves are long and roomy. This garment is machine washable in warm water and may be tumbled dry on a low heat setting. It is available for purchase in sizes Medium, Large and Extra Large.